I am truly humbled by each story of our students. Each of their unique stories tells why they choose to learn to read to better their life…a better job, better health and the ability to be self sufficient. What a wonderful gift to give. We greatly appreciate each donation and hour of time volunteered this past year. We are truly thankful for your guidance, leadership and friendship. 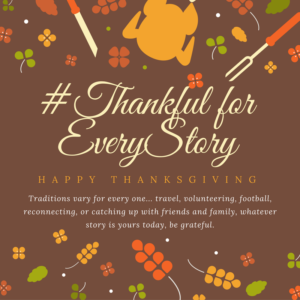 On behalf of The Literacy Center team and our board of directors, we wish you the happiest Thanksgiving as you create your story. Take a survey for to help us with our strategic plan. https://www.surveymonkey.com/r/2569TMB. All volunteers and past donors are welcome at our strategic planning session on Friday, January 27, 8am-12pm. Email jennifer@litcenter.org for invitation. Volunteer to tutor, teach a class, serve on Board of Directors or work in office. Participate in a fundraiser, like the Barnes & Noble Bookfair on Sunday or SCRABBLE Smackdown on February 25, 2017. We are now looking for SCRABBLE Smackdown sponsors starting at $100.